Thank you for visiting us on the web and we hope to see you in person soon. Our Veterinarians and staff are dedicated to helping your pet stay healthy and happy. We take pride in providing our patients with the highest quality veterinary care using state-of-the-art techniques and equipment but not forgetting that love and compassion and a gentle hand is just as important. We have on site digital radiography, lab, ultrasound, companion laser therapy, pharmacy, and boarding in our 6,000sq ft facility. 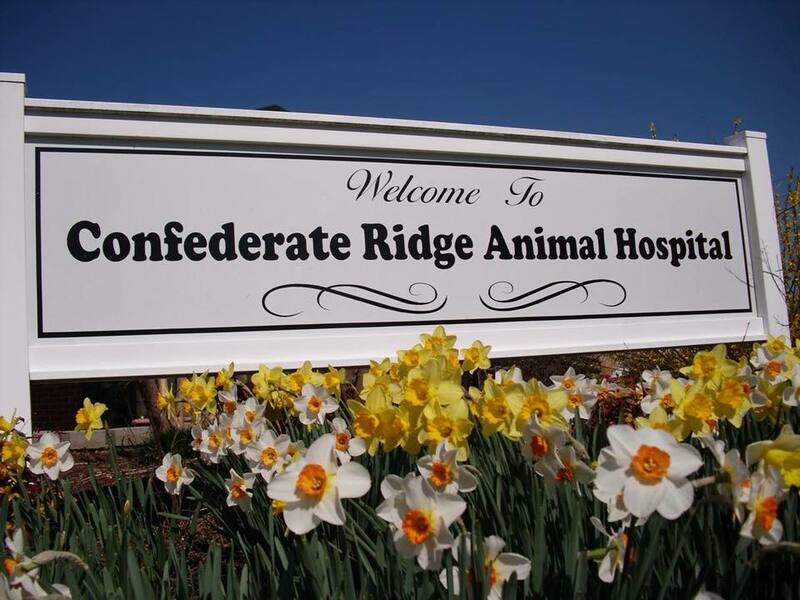 Confederate Ridge Animal Hospital is a full service animal hospital and will take both emergency cases as well as less urgent medical, surgical, and dental issues. Our doctors are experienced in all types of conditions and treatments. Beyond first rate pet care, we make our clinic comfortable, kid-friendly, and a very calm environment so your pet can relax in the waiting room and look forward to meeting with your veterinarian. Dr. Howard Gregory started a practice in an old gas station in downtown Fredericksburg, Virginia, in the 1950s. In about 1960 he moved the practice to a new building at 2301 Jefferson Davis Highway which he named Confederate Ridge Animal Hospital because the building is located in the community of Confederate Ridge. In 1967, Dr. Alan Witter graduated from the Cornell University Veterinary School and became an associate of Dr. Gregory’s, subsequently purchasing half of the practice after several years. The practice was originally both a small and large animal practice, as Fredericksburg was a relatively rural area in the 1960s. At that time, there was mostly livestock and dairy farmland. Dr. James Dunlap became an associate in 1972 and bought Dr. Gregory’s half of the practice in the early eighties. Dr. Dunlap and Dr. Witter opened Potomac Ridge Animal Hospital on Rt. 205 on the way to Colonial Beach in the mid 1990s. In 1997, Dr. Witter and Dr. Dunlap separated the two practices and Dr. Witter began construction of the current building behind the original Confederate Ridge Animal Hospital. Dr. Newman is a 1988 Virginia Tech Veterinary School graduate and has been on staff as an Associate Veterinarian at Confederate Ridge since 2004. Jessica Keaton, LVT has been a happy member of the Confederate Ridge Team since summer of 2002. Confederate Ridge welcomed Dr. Collins as an Associate Veterinarian in June 2005, she is a Perdue Veterinary School graduate. In January 2018, with great enthusiasm, Dolores Newman, DVM and Jessica Keaton, LVT announced their new ownership of Confederate Ridge Animal Hospital. We thank Dr. Witter for entrusting us to carry on the practice of caring for and healing patients built through hard work and dedication. We have convinced Dr. Witter to continue to see patients on occasion and we wish him the best of luck as he moves on to farming in Missouri. Dr. Elizabeth Collins is remaining on board and we are grateful to have her support on this new path. In addition, you can expect the same dedicated service from the familiar faces of our licensed veterinary technicians, receptionists, and assistants. All of us at Confederate Ridge Animal Hospital believe the outstanding, personalized service we provide to our clients and patients starts with the love between pets and their owners. We look excitedly toward the future with a foundation based on a mutual love for animals and one another. We are humbled by your loyalty and continued support. 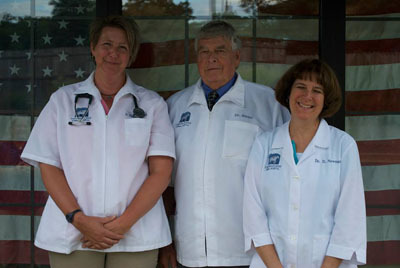 At Confederate Ridge Animal Hospital, we treat your pets like the valued family members they are. I am Doctor Alan Witter, aka. “Doc.” I am a graduate of Cornell’s Veterinary School, as was my father before me and my brother after me. My uncle and one cousin are also veterinarians, so veterinary medicine seems to have run in the family. I am mostly retired and only work a few hours every month so you may see me some Saturday mornings. Hi! I am Dolores Newman, one of the new owners at Confederate Ridge Animal Hospital. I was born in Philadelphia and grew up in New Jersey. I have lived in Virginia for 28 years. I am a Virginia Tech alumni of both undergraduate and vet school. Caroline County is my home along with my wonderful supportive husband, Rod. My 4 children are grown either finishing college or starting their careers. However my house is never boring with 3 active dogs and 5 cats. We have just added some baby chickens to the menagerie. Confederate Ridge Animal Hospital is a great place to spend my days with a superb staff and fantastic clients and patients. In my spare time I do enjoy gardening, reading, cooking and hiking with my husband and Great Dane Bethy. I was born and raised in rural Northwest Pennsylvania. After attending undergraduate school in Ohio, I graduated from Purdue University of Veterinary Medicine in 1991. For the next 14 years I worked at a mixed animal practice not far from where I grew up. While I enjoyed working on the numerous dairy cattle in the region and had many great small animal clients and patients, the long winters and too many nights of on-call emergencies became a burden. So, in 2005 I moved with my young family to King George to work For Confederate Ridge Animal Hospital. Life is good again, I do not miss the snow and on-call work! I am happily married to my husband James, who I met in college. We have two children, both grown and in college now. On any given weekend I can be found in my kayak out on one of the area’s many rivers. Catfish fear me. Over the last few years I have become an avid fossil hunter and ancient history enthusiast. I am a happy camper and enjoy spending days traipsing through the woods in search of waterfalls and mountain vistas and in the night, sleeping in my homebuilt teardrop trailer. I like to get to know my clients and their pets, and to treat them the same as my own family and pets, I am happy that the pace of work and great support staff here at Confederate Ridge allow me to do that. "Thank you very much for everything you do for our little "Samantha" and our fat cat "Hercules". We really appreciate each one of you and the special TLC you give our pets."